The first IR spectrum that will be presented is that of the oral filament sample that has been discussed at length by this researcher in numerous reports on this site. This filament is produced with the so-called “red-wine test”, that was discovered and that is credited to Dr. Gwen Scott several years ago. The process of this simple test as well as the general chemistry of the reaction (involving anthocyanins) has also been discussed elsewhere on this site. 1. The oral filament sample is extracted from the gums of the individual using red wine. 2. The filament sample is rinsed thoroughly in numerous exchanges of distilled water. 3. The sample is dried thoroughly in a watch glass under low heat. 4. The sample is then scraped and pulverized to powder form. 5. A small amount of ethanol is added for purposes of further grinding with a pestle to small particle size. 6. The ethanol is then allowed to evaporate thoroughly. 7. The sample is then sandwiched into a polyethylene sample card and the spectrum compared to a reference card of polyethylene. Polyethylene has certain absorption peaks (alkanes) which are to be ignored in the analysis of the spectrum (especially ~2800-3000 cm-1 and the peak at approximately 1465 cm-1). Additional sampling equipment, hopefully to be acquired in the near future (e.g., salt crystals), will provide additional substrate references to eliminate this interference. Cost is a factor that prevents this from occurring at this time. 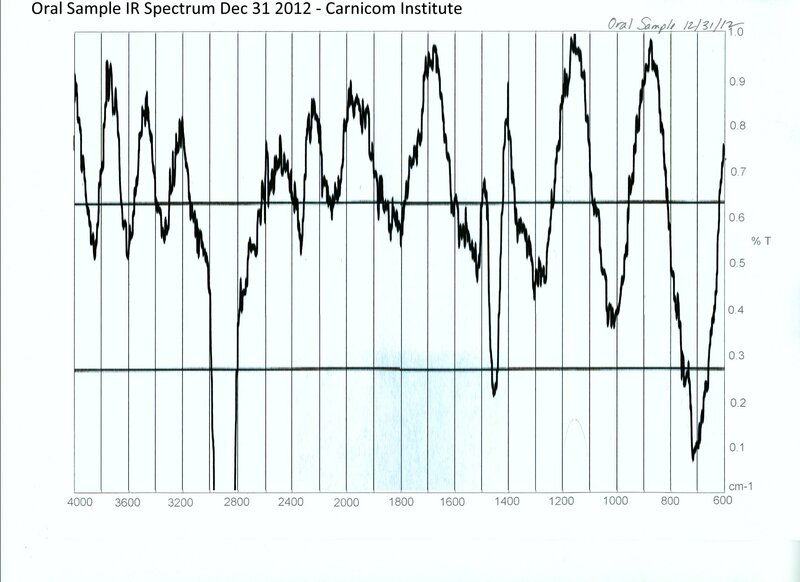 The resulting spectrum is shown below and it has many interesting features that will be discussed at length in future reports. The objective of this report is simply to make the case of identity between the oral sample and the subsequent cultures developed from those oral samples. Functional group analysis of the spectra will be an important topic of discussion, but it shall be reserved for the future as time and circumstances permit. 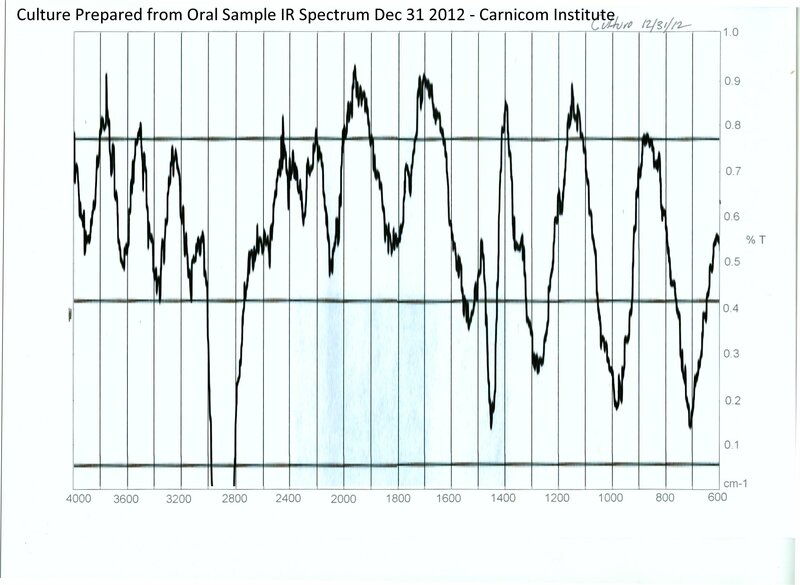 Oral Sample Infrared Spectrum. The horizontal axis corresponds to wavelength (cm-1) and the vertical axis is that of % transmittance (normalized). The spectrum is relatively complex in nature and the particulars of the functional groups inherent within will be discussed at length in the future. At this point, the locations of the troughs of the chart, e.g, ~2350 cm-1, 2100 cm-1, 1800-1900 cm-1, 1250-1300 cm-1, 1000-1030 cm-1 and 720 cm-1 can be noted as specific and distinct reference points. A spectrum is essentially a unique fingerprint of an organic substance or compound; the complexity of this particular spectrum even further emphasizes this point. The absorption peaks at ~2800-3000 and at ~1465 are to be dismissed in this analysis at this time (only) due to the spectral behavior of polyethylene used as a substrate; the clipping of the former peak range is intentional for the graphic presentation. The spectrum of the culture growth, as developed from the oral filament samples, is also shown below. The method of preparation is similar to that of the above, with a few exceptions. In the case of the culture growth, an extract is prepared prior to the steps outlined above. This extraction process has also been described elsewhere on this site, but it basically involves a process of substantial growth over weeks to months of time, several thorough rinsing stages, complete drying and pulverization and then subjecting the resulting powder to a sodium hydroxide and heating process. Extensive chemical testing, chromatography, electrolysis, ninhydrin analysis and visible light spectroscopy analysis has been applied to this extract and this has been reported on in detail on this site. 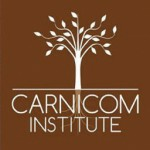 Please see these reports for additional background information on studies by the Carnicom Institute on the Morgellons condition. The conclusion that can be reasonably made from the presentation of these spectra is that they are essentially of one and the same thing. This effectively means that all of the conclusions that have been drawn by this researcher over a period of several years that were applied previously to the culture forms may now be equally applied to the original oral filaments. This is an expression of the value of the culture process itself, and is one of the many reasons that so much effort and time was dedicated to that process over a period of many years. It also can be stated, in equivalent form, that the assessments and conclusions reached with the use of these cultures has a level of validity that is expected to apply to the human body. It is asserted once again that no medical diagnosis of any kind is implied or stated within this report; it is being stated that the culture forms represent a viable means of study of metabolism and biochemical structure that holds numerous advantages over attempting to study these same processes within the human body. Infrared Spectrum of Culture Developed from an Oral Filament Sample (normalized). Note that the two spectra, the oral sample and the culture derived from that same oral sample, are essentially one and the same. 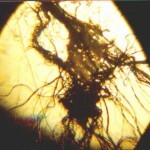 This report will therefore further dispute any claims that are made regarding the insignificance of the oral filament samples and the cultures that are derived from those same oral filaments. It will further dispute any inadequate research claims regarding unrelated precipitation reactions involving wine and saliva (also discussed elsewhere on this site); such claims do not apply to this situation and they remain ludicrous under the volume of study that has accumulated. This report will further dispute any claims of a delusional, psychological or metaphysical characterization of the physical samples that exist and that can be reliably cultured and studied. 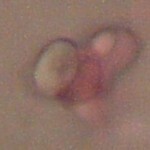 This report will dispute any claim of simple classification to a known mold or fungal species; such identification remains unestablished and all signs continue to point to uniqueness and complexity in the affair. The molecular structure of this organism exists quite aptly in this physical world and it is taking its toll upon the human population as long as it exists. This physical structure will continue to be elucidated by this researcher so that its biochemistry and its interaction with the body can be properly understood and eventually thwarted.